Anatase is a relatively uncommon gemmy form of titanium dioxide that forms very small unique crystals. The name anatase comes from a Greek word meaning "elongation," referencing its elongated crystal form. Anatase is a polymorph to the more common rutile, as well as brookite. 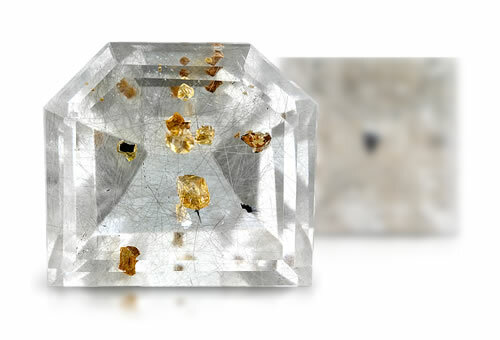 We sometimes see long rutile needles shooting through gemstones, but small anatase crystal inclusions is a much rarer occurrence. Like rutile, anatase usually occurs in honey-yellow, brown to reddish brown, black or deep blue colors. Anatase is a polymorph of rutile and brookite. Anatase in quartz will have anatase inclusions and may contain liquid, two-phase and three-phase inclusions, negative crystals, minerals, needles, rutile, iron particles.